This new stage version of Roddy Doyle’s novel, set in 1986 Dublin is a joy from beginning to end. Fans of the 1991 film directed by Alan Parker may be disappointed only in that unlike the film, it has a happy ending. True to its gritty roots, the play takes place on a council estate in a rundown neighbourhood, beautifully conveyed by Soutra Gilmour’s versatile set where the world is limited to a café, a laundrette, a community hall and a garage (although a slaughterhouse is also brought in!). The Commitments tells the story of young Jimmy Rabitte who is in love with American soul music and wants to create and manage his own band. His supportive family put up with his friends and bandmates trooping in and out of the house, playing loud Stevie Wonder and Wilson Pickett on the record player. Piecing together a rag tag band of friends and auditionees, including Joey the Lips Fagin who claims to have played with Otis Redding, Marvin Gaye and James Brown, Jimmy soon has his group. The lead singer, Deco, is a pig, singing with a mouthful of chips and constantly picking his nose, but has the voice of a Motown star. The girls, brought in for the glamour, fare less well but with enough practice, and much attention from Joey the Lips, they soon improve to compete with Deco for the limelight. The grim reality of the working class of Dublin in 1986 is only touched upon- Billy is told off for smoking hash at a rehearsal as Derek’s brother had a drug problem. The band gets a gig at the bingo hall by saying it’s an anti-heroin campaign. Violent Mickah, who is hired as a sort of bouncer, looks and behaves like a skin head but is very loyal and really just wants to be part of the band, ending up as their Animal- like drummer. 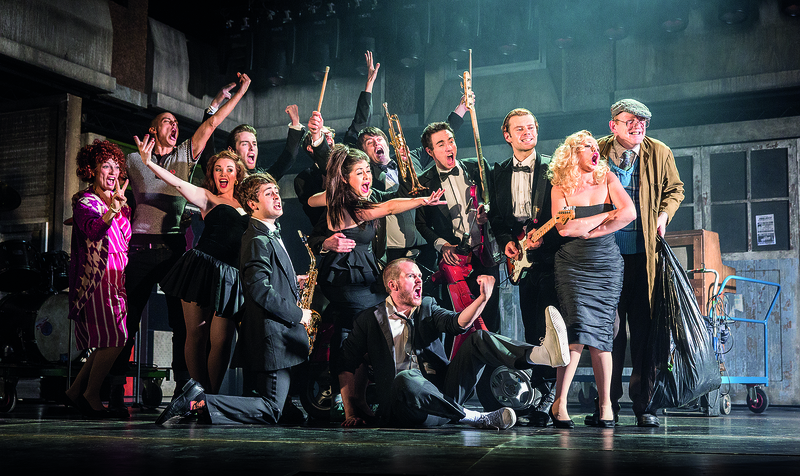 The wonderful thing about this version of The Commitments is that it is a musical that feels like a play. In the first act a lot of the great soul hits are played scrappily, cut off in the middle or sung badly as the group learns to be a band in Joey’s mother’s garage. As their skills improve and they start to get actual gigs, the music comes pouring out, and the audience roots for them to succeed. By the finale, the audience could no longer contain themselves and were up on their feet dancing and absolutely loving the characters they had got to know during the course of the play. It wouldn’t be giving anything away to say that although the band does implode as in the original story, just when they are about to be offered a recording contract, the ending is less depressing and more like a party. Credit must go to director Jamie Lloyd, who gives the play a messy, natural feel even while delivering tight musical numbers. Roddy Doyle himself wrote the book, preserving his own unique dialogue. The performers were excellent, worked well together as a group and many of the cast managed to slip in and out of several ensemble roles with ease. Denis Grindell was bursting with excitement and energy as Jimmy Rabitte, Ben Fox shone as the newly religious but still randy Joey the Lips, Joe Woolmer managed to be both hilarious and dangerous as Mickah, and Killian Donnelly was a stand out in every way as the occasionally repellent Deco. The wiry, physical actor could not have been further from the famous Deco of The Commitments film, Andrew Strong, who was more confrontational and obnoxious. This Deco just has no interest in social conventions and lives his life how he wants to. He is odd and eccentric rather than dislikeable. Mr Donnelly has an exceptional voice and with the very talented Jessica Cervi, Stephanie McKeon and Sarah O’Connor, gave the audience their money’s worth of searing Irish soul music. Audience members were happily singing and still dancing on the way out. To eat well in England you should have breakfast three times a day, according to writer Somerset Maugham. The Full English is the world's most famous breakfast and the only one named after a country. Also known as ‘the Fry Up‘ and ‘the Full Monty‘, this enormous, traditional morning meal, I must warn you, is not for the fainthearted, for those watching their cholesterol or for eating every day of the week. Nowadays your average Brit is likely to limit intake of The Full English to a special treat on weekends or holidays. It's a meal which will keep you full for the entire day and, according to The Breakfast Bible requires key components of eggs, bacon, sausages, grilled tomatoes, fried mushrooms, black pudding, baked beans, plenty of toast with jam or marmalade, ideally washed down by triple strength mugs of tea. Optional add-ons include porridge, potatoes, kippers, bubble and squeak and, if you dare, lashings of deep fried bread. In Victorian times, when British breakfast took pride of place on the menu, you might also find hashed mutton, kidney omelette, tongue and guinea fowl in jellied aspic. Calories? What calories? Nowadays you can eat your way round the country on The Full English, as it's easily found in every town, village, hotel and farmhouse bed and breakfast. A few scrumptious options in London include Hawksmoor, Bill’s, The Regency Cafe and The Wolseley; outside the capital I've heard great things about The Market Diner in Brighton ('Home of the Original Gutbuster'), Cafe Al Fresco in Dartmouth and Tebay Motorway Services near the Lake District. And if you'd like to know more about The Full English, I recommend you to the London Review of Breakfasts. Here you'll find frank, reliable and frequently sidesplitting reviews from dedicated breakfasteers like Chris P. Bacon, Malcolm Eggs, Salmon De Beauvoir, Homefries Bogart and Rhys Chris-Peese. It had been a while, but we were very much looking forward to our return to The Dorchester on Park Lane. This hotel, and its various restaurants, remains a favourite of our London venues. It has always stood out as a unique and glamorous dining destination, and our expectations were high, as you would expect from a restaurant within this classic property. On this occasion we were there to sample some home grown British cuisine in The Grill at The Dorchester. The Grill at The Dorchester re-opened in 2005 after a complete refurbishment. As you walk into the restaurant, Thierry Despont’s distinctive design makes quite an impact. 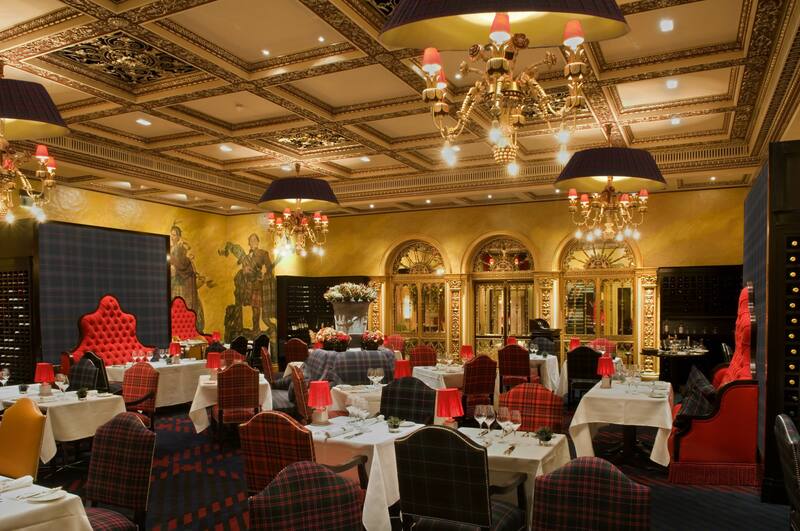 The design references the Scottish ancestry of The Dorchester’s original owners, and also the ‘Best of British’ menu. Bold murals adorn the walls and plush red banquettes and ornate gold detail on the ceiling and doors add to its sense of opulence. A dramatic display of 200 red roses stands in the centre. We loved this bold décor, although it may gather some varied opinion amongst diners. Soon after we had been seated, the champagne trolley arrived, and we chose a cold glass of Laurent-Perrier – the perfect way to commence any meal! After we had settled in, we were presented with the menus and began the arduous task of choosing our meal. The Festive Menu was extremely tempting, but as this review isn’t published until the spring, this would no longer be available. I understand that they do, however, offer seasonal Tasting Menus (£55 for four courses excluding wines, or £90 for four courses with wine pairing) over the year to suit the season or upcoming British occasions. One of the signature appetisers is the Home Smoked Loch Duart salmon and gravadlax (£22). I wanted to experience a dish that is so highly regarded with diners, and I was not disappointed. It was carved at the table into the finest slices; the taste was light and fresh with a unique smoked flavour that is the result of a lengthy process in the Dorchester’s very own smokehouse. It was perfectly matched with a glass of 2010 St. Clair, Marlborough Sauvignon Blanc from New Zealand, recommended by the Sommelier. My guest thoroughly enjoyed her Roast Scallop, cucumber and celeriac (£17). Cooked to perfection, the Scallops were succulent with a subtle sweetness; a result I never quite seem to be able to achieve at home, in spite of many years trying! Appetisers range in price from £12 to £22, and other options include Glazed Pigeon or Duck and foie gras terrine. Studying the menu, it is evident to see The Grill's passion for sourcing quality, organic produce from around the British Isles. With Executive Chef, Henry Brosi at the helm, the modern British cuisine offers a contemporary menu, putting a fresh spin on traditional Grill dishes with timeless classics. The main courses on offer during this season include pork, duck, fish, veal, vegetable and beef dishes. Prices range from £20 to £49. For the main course I was tempted by another of their signature dishes – Black Angus Beef fillet, chervil root, chestnut and citrus (£36). Complemented with shallots and chive mash (£5) and garlic spinach (£5), this meal was superb. The cut was wonderfully tender; a true classic. My guest chose the Grilled day boat Dover Sole (£49). The delicate buttery tones combined with a melt in the mouth texture found favour with my partner. Once again, the Sommelier perfectly matched our menu choices with exemplary wines from the list. The wine list comes in it’s own leather bound book indicating the serious and passionate nature in which they consider their wines. Needless to say, this has to be one of the most extensive wine lists available in London, offering New and Old World Wines, and some celebrated, classic vintages. The Sommelier was extremely knowledgeable and if, like us, your own experience is limited, then why not place your wine choice in the hands of an expert? Throughout the meal we were treated to various delicious Amuse Bouches. Each of these gastronomic treats, whetted the palette and introduced us further to the exciting delicious creations of Brosi and his team. Given the choice we probably wouldn’t have selected either of the desserts we were persuaded into ordering, but we were glad that we took the waiter’s recommendations on board. I enjoyed Hazelnut Moelleux, Marscapone Ice Cream (£13), and my guest devoured her White Chocolate Cream, pistachio, textured raspberry (£10). We did, of course, both sample each others desserts - it would have been rude not to! They brought the perfect conclusion to a wonderful meal. Dessert prices range from £10 to £14, and be sure to save some space – they were amazing. The Grill’s staff excel in their roles– being extremely knowledgeable and passionate, yet at the same time unobtrusive. With such excellent service, a comfortable atmosphere, and some of the best British cooking we have enjoyed in a long time, I defy the best ‘foodie’ not to enjoy this classic dining experience. We are already looking at the list of the other restaurants The Dorchester has to offer, and in the meantime would wholeheartedly recommend a visit to The Grill. American expat and Anglophile Henry James famously quipped, “There are few hours in life more agreeable than the hour dedicated to the ceremony known as afternoon tea." Whether it’s ‘builder’s brew’ in a chipped mug, black Assam leaves poured into fine porcelain or a pot served with scones, cream and jam in a village tea shop, you’ll find infinite ways to enjoy the universal British sport known as teatime. But for a long time tea was a drink only the rich could afford, not surprising when a pound of tea might cost a labourer his annual wage. By the late 18th century the price of tea went down and its popularity shot up. The Victorian Duchess of Bedford, desperate for a pick me up between lunch and dinner, is commonly given credit for inventing the ritual of afternoon tea. Traditional afternoon tea has long been top of the list for visitors to Britain and an immensely enjoyable special treat for the rest of us. With countless London and provincial hotels, restaurants and cafes offering up their version of afternoon tea, it’s not surprising that competition for the UK Tea Guild awards, the Oscars of the tea world, is a stiff one. Standing head and shoulders above the fray, winning the Guild’s Award of Excellence for the past six years and Top London Afternoon Tea Place in 2011, is the deserving legend that is Claridge’s Hotel. Claridge’s is nestled in Mayfair’s cosy heart, finger-sandwiched between the shopping buzz of Oxford Street and Piccadilly’s traffic roar but a world away in atmosphere, elegance and ambience. Tea time takes place in the hotel’s splendid Art Deco foyer and the adjacent Reading Room, and Claridge’s takes this daily celebration very seriously indeed. It just gets all the details right, from the generously filled all-you-can-eat sandwiches, scones with clotted cream and daily changing pastries created under the baking baton of Head Pastry Chef Nick Patterson to the exquisite live music and friendly, energetic and uniformly knowledgeable staff. Tea timers have the very challenging task of selecting their fresh brew or infusion from over 40 specialty blends from around the globe. Deservedly most popular is Claridge’s own Royal Blend, but it’s a tough decision when the lovingly described menu includes tempting Cornish Tregnothnan Estate teas, exclusive Royal White Silver Needles and hand rolled Dragon Pearl Jasmine. Infusion lovers should consider the extraordinary Japanese Sencha Genmai Cha, a fragrant green tea laced with tiny toasted puffs of popcorn and rice. Never mind: those lovely Claridge’s staff will happily suggest you try something different for your second pot. Or your third.